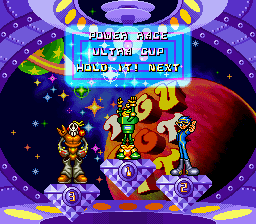 Another Mode 7 racer, but with bizzare graphics. 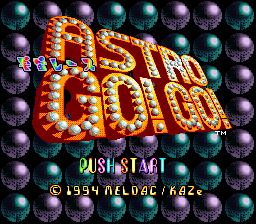 Astro Go-Go is a strange game. On seeing still shots it looks like a hyper copy of F-Zero but upon playing, unfortunately this isn't even near it's class!!! The view point is at such a bad angle you can't see corners until you are right at them. And while the game is fast, the graphics are crowded and confusing, plus there is a feeling that when you steer, it's the track that rotates and not the car that turns. Music also is of 8-Bit standard and has you reaching for the off button. 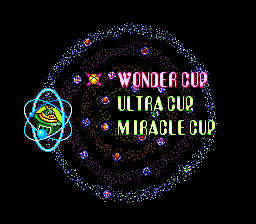 The only redeeming feature (as with most games) is it's 2 player game, and does offer some level of fun. 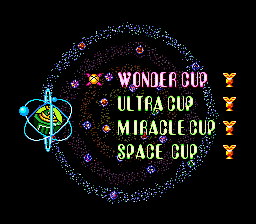 Overall this is a strange F-Zero clone with no where near as much class.